Andre Heimgartner has described finishing on the podium for the first time as a solo driver at the WD-40 Phillip Island SuperSprint as a box ‘ticked off’ in his career. The 23-year-old already had one podium to his name when he co-drove with Tim Slade to a third placing in the rain on the Gold Coast in 2017. Heimgartner’s performance in that Pirtek Enduro Cup campaign, when he was a late call-up to replace the injured Ash Walsh, reignited his Virgin Australia Supercars Championship career as he was picked up to replace the retiring Todd Kelly for the following season. 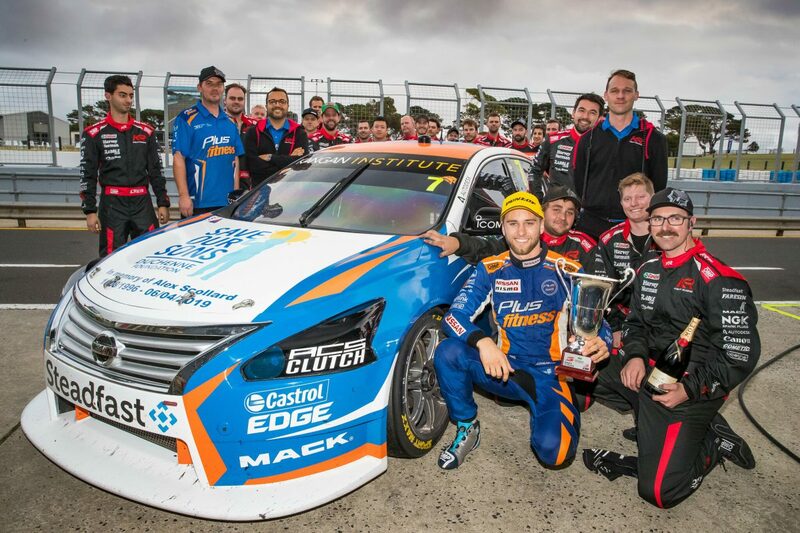 His best result in his own car, however, had been a sixth on the streets of Newcastle in the final race of 2018 in the #7 Plus Fitness Altima. That was until he finished behind only the DJR Team Penske pair of Scott McLaughlin and Fabian Coulthard in Race 9 of the current season, having qualified fourth for the 120km affair. The New Zealander’s result came on a strong day for Kelly Racing, which has battled in understanding a revised aerodynamic package on its now privately-run Nissan Altimas so far in 2019. “It’s great to be up here, obviously it’s good to tick that box off and (it has) sort of been the one thing I’ve been missing, and having consistent races, and managed to put qualifying together (today),” said Heimgartner. He was nevertheless made to work for the podium by none other than team co-owner Rick Kelly, who leaped from sixth to third at the start of the race and therefore earned strategic priority given that the #7 and #15 Castrol Altimas are paired in pit lane. They pitted a lap apart and resumed virtually together on the race track before Heimgartner made a bold move on Kelly at the high-speed Hayshed, although that wasn’t the end of the story. “He definitely wasn’t making it easy for me,” recalled Heimgartner. “He was drilling the back of me when I was trying to get on the gas and I was sideways and he wasn’t letting up. Then the next corner did the same thing. Kelly went on to finish seventh, after taking 11th in Race 1 of the season and no higher than 15th since then, while Simona De Silvestro was 16th and rookie Garry Jacobson 19th. Heimgartner’s renewal with Kelly Racing for 2019 was a protracted process due to important commercial considerations, although team manager Scott Sinclair said after today’s result that he had “full faith” in the Kiwi. Sinclair said that the performance was a reward for the team, including the crew on Car #7 led by engineer Dilan Talabani. “It was a good day today, no doubt about it,” he told Speedcafe.com. “Fantastic for Andre, first podium. He’s worked hard, he’s done a great job. The guys on his car have done a great job for 12, 13, 14 months now, so it’s really rewarding for them. “It’s great for the team, we’ve had well-documented struggles since the start of this year, so we’re slowly getting there. Sinclair was, however, cautious about getting carried away with what is far and away the best day for Kelly Racing so far in 2019 after predictions of a Phillip Island ‘grind’. “It’s exciting (but) we know there’s a lot of hard work to go,” he noted. “We haven’t won the championship; we’ll keep grinding it out but it is a good reward for everyone and also confirmation we are on the improve which is the most important thing. “That gives us hope that what we’re doing is working, and we need to work. We’re already looking forward to going to Perth (next event) and seeing how we go. Heimgartner continues to be the lead Kelly Racing driver in the championship, moving from 15th to 12th in the standings in Race 9.